Click the link for your free preschool prep role play scenarios. Inside: Find out what preschoolers really need to be prepared with to enter preschool. 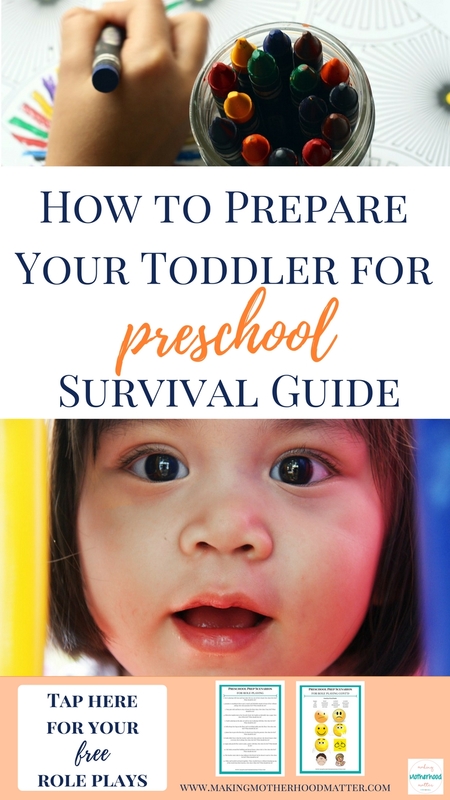 Help prepare your toddler for preschool with this survival guide containing five of the most important skills toddlers need to know. Including printable role play scenarios and emotion cards for social skill practice. Entering preschool can be a nerve-racking time for toddlers and parents. A common misconception is that the main skills toddlers need to enter preschool are academic. The truth is that educators will tell you the real skills toddlers need to come prepared with are social and emotional. Discover how to prepare your toddler for preschool with this survival guide containing five of the most important skills toddlers need to know. Click here to get your scenarios and emotion cards to practice with your toddler. Teaching your toddler about self-control will help prepare your toddler for preschool. When entering preschool, toddlers need to be able to keep their hands to themselves, listen to a teacher giving instructions, wait for their turn and more. Parents can help toddlers learn self-control by starting small. Much of the self-control needed for preschool will involve waiting. Waiting for their turn. Waiting in line. Waiting to talk until the teacher is done talking. Parents can begin by giving toddlers small opportunities to wait for activities, items, or toys they want and building up the toddler’s endurance for self-control. Preschoolers will be presented with many opportunities to explore new situations and objects. One skill that will prepare your toddler for preschool is responsibility. Parents can teach toddlers responsibility by completing activities with the child and modeling explicitly how to explore new tools. For example, parents can teach toddlers how to use crayons gently so they don’t break, clean up wrappers up after a snack, or put items away in an organized way. Toddlers will need to be taught specifically how to take care of items in a responsible way. Preschool for many toddlers will be an opportunity to be surrounded by many peers. With this opportunity will come the need to talk about emotions, both positive and negative. Preschoolers will be faced with situations in which they need to solve conflicts with peers. One great way parents can practice expressing different emotions and conflict resolution is through role playing scenarios with their toddler. 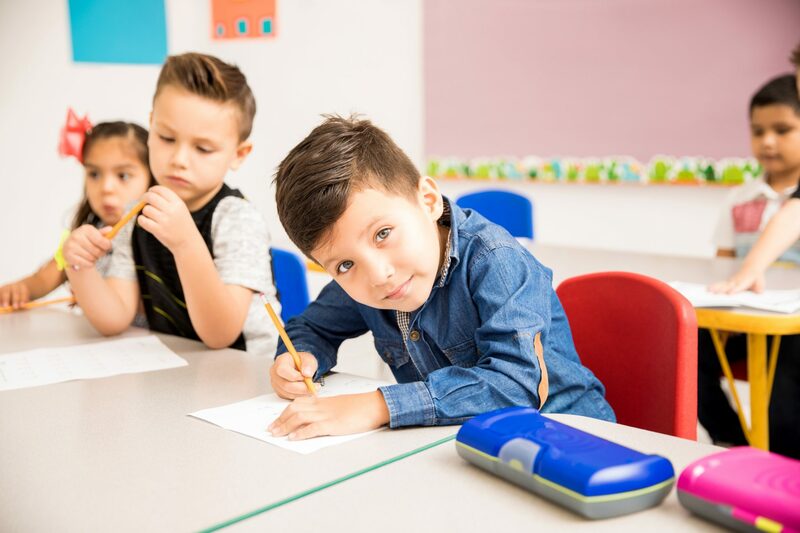 In each role play, toddlers will have the opportunity to practice problem-solving of classroom situations or reinforcing positive social skills. Click here to get your scenarios and emotion cards to practice with your toddler. How will your family prepare your toddler for preschool? P.S. If you enjoyed this piece, you may also like Over 100 Easy Kids Activities That are Surprisingly Fun. Following directions is a good one and probably the hardest for most toddlers to do. I love this! I seem like every single post I see deals with the academics of preschool. Which, don't get me wrong - my blog's focus is on fun messy, fun active academic preschool activities - but, very few of them concentrate on non-academics. I was sitting here in my living room floor the other night putting together some inclusion activities for my L1 18mo old to play WITH my 3 year old, and I started contemplating how I can teach her to write her name. She spells it. She recognizes it. But, I started panicking she can't write it. WHAT?!!?!? WHY would I expect my 3 year old to WRITE her name? WHYYY?Thank GOD she is well-rounded. But IDK why she is. Lucky parenting I guess. 'Cause i haven't spent time researching how to teach her the things here. I'm told she knows them well. That's awesome. But now that I'm aware, I can help my other two better and not rely on luck. THANK YOU for your psots like this! I love that your suggested skills focus on emotional and social skills rather than teaching the ABCs. Don't get me wrong, I'm all for academics, but they will learn the curriculum so much better if the skills you discuss are in place. 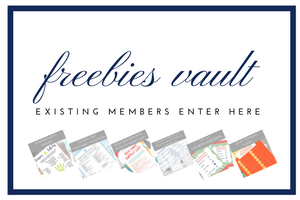 I've been working really hard with my little guys to help them become contributors and problem-solvers (and we seriously struggle some days), but I think it's so important. Thanks for this! As a former educator, I am a huge advocate for teaching academic skills too, so I am glad you mentioned that. I love that you are working with your boys on contributing and problem-solving. Go mom! This is an excellent post and something a lot of parents don't think of. I never thought of using Simon Says to teach following directions! Yes, I love using games to teach new skills. Awesome article! I really like how you pointed out self control as well as responsibility. Those two alone can really vary from one toddler to the next and to focus on those skills would be super beneficial before the big day. Thank, Dani. I agree, these two are so important and depending on the child can come naturally or can be a big challenge. Great post! Luckily for us pre-school is a long way off, gotta actually have this baby first haha but I completely agree that these are all necessary and important things for toddlers to learn as they form the foundations for interactions for the rest of their lives. This is excellent! We struggle with the first one the most. Our three and a half year old wants "it" now and wants to talk "right now" and just has a very hard time waiting and having any self control. Thanks for sharing your thoughts Pamela, I agree.